A ground breaking work that lifts the veil of secrecy on teacher hiring. This insider information provides aspiring teachers a powerful and affirming 'edge' in the teacher interview process. THE 'handbook' for anyone headed into a teacher interview. 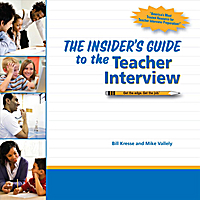 The Insider’s Guide to the Teacher Interview gives aspiring teachers a powerful “edge” in the teacher interview process. Drawing from their years of experience hiring teachers as school administrators, authors, Mike and Bill lift the veil of secrecy behind teacher hiring and tell you exactly what it takes to land the teaching job of your dreams. This groundbreaking insider perspective delivers an affirming approach to getting an interview, writing cover letters and resumés, researching schools, and maximizing teaching portfolios. The guide is a unique resource offering a glimpse at what few candidates ever get to see: authentic documents being used by administrators across the nation to hire including resume screening tools, interview rubrics, written tasks, teaching demonstration scenarios, and much, much, more. Add to this their innovative Umbrella ApproachTM to comfortably mastering any and all teaching interview questions, and these two educational insiders will quickly have you prepared to navigate anything that you encounter.